John Quincy Adams was extraordinarily well qualified to serve as president, yet his one term in office was unhappy and he could boast of few accomplishments while in office. The son of a president, and a former diplomat and secretary of state, he came to the presidency following a contentious election that had to be decided in the House of Representatives. Here are the critical things you should know about President John Quincy Adams. Born: July 11, 1767 at his family's farm in Braintree, Massachusetts. Died: At the age of 80, February 23, 1848 in the U.S. Capitol building in Washington, D.C. The election of 1824 was highly controversial, and became known as The Corrupt Bargain. And the election of 1828 was particularly nasty, and ranks as one of the roughest presidential campaigns in history. John Quincy Adams had few accomplishments as president, as his agenda was routinely blocked by his political enemies. He came into office with ambitious plans for public improvements, which included building canals and roads, and even planning a national observatory for the study of the heavens. As president, Adams was probably ahead of his time. And while he may have been one of the most intelligent men to serve as president, he could come off as aloof and arrogant. However, as Secretary of State in the administration of his predecessor, James Monroe, it was Adams who wrote the Monroe Doctrine and in some ways defined American foreign policy for decades. Adams had no natural political affiliation and often steered and independent course. He had been elected to the U.S. Senate as a Federalist from Massachusetts, but split with the party by supporting Thomas Jefferson's commercial warfare against Britain embodied in the Embargo Act of 1807. Later in life Adams was loosely affiliated with the Whig Party, but he was not officially a member of any party. Adams had intense critics, who tended to be supporters of Andrew Jackson. The Jacksonians vilified Adams, viewing him as an aristocrat and an enemy of the common man. In the election 1828, one of the dirtiest political campaigns ever conducted, the Jacksonians openly accused Adams of being a criminal. Adams married Louisa Catherine Johnson on July 26, 1797. They had three sons, two of whom led scandalous lives. The third son, Charles Frances Adams, became an American ambassador and a member of the U.S. House of Representatives. Adams was the son of John Adams, one of the Founding Fathers and the second president of the United States, and Abigail Adams. Because of his proficiency in French, which the Russian court used in its diplomatic work, Adams was sent as a member of the American mission to Russia in 1781, when he was only 14 years old. He later traveled in Europe, and, having already started his career as an American diplomat, returned to the United States to begin college in 1785. In the 1790s he practiced law for a time before returning to the diplomatic service. He represented the United States in the Netherlands and at the Prussian Court. During the War of 1812, Adams was appointed one of the American commissioners who negotiated the Treaty of Ghent with the British, ending the war. After serving as president, Adams was elected to the House of Representatives from his home state of Massachusetts. He preferred serving in Congress to being president, and on Capitol Hill he led the effort to overturn the "gag rules" which prevented the issue of slavery from even being discussed. "Old Man Eloquent," which was taken from a sonnet by John Milton. When he took the presidential oath of office on March 4, 1825, Adams placed his hand on a book of the laws of the United States. He remains the only president not to use a Bible during the oath. Adams was carried into an office adjacent to the old House chamber (now known as Statuary Hall in the Capitol) where he died two days later, without regaining consciousness. The funeral for Adams was a large outpouring of public grief. Though he gathered many political opponents in his lifetime, he had also been a familiar personage in American public life for decades. Members of Congress eulogized Adams during a funeral service held in the Capitol. And his body was escorted back to Massachusetts by a 30-man delegation which included a member of Congress from each state and territory. Along the way, ceremonies were held in Baltimore, Philadelphia, and New York City. 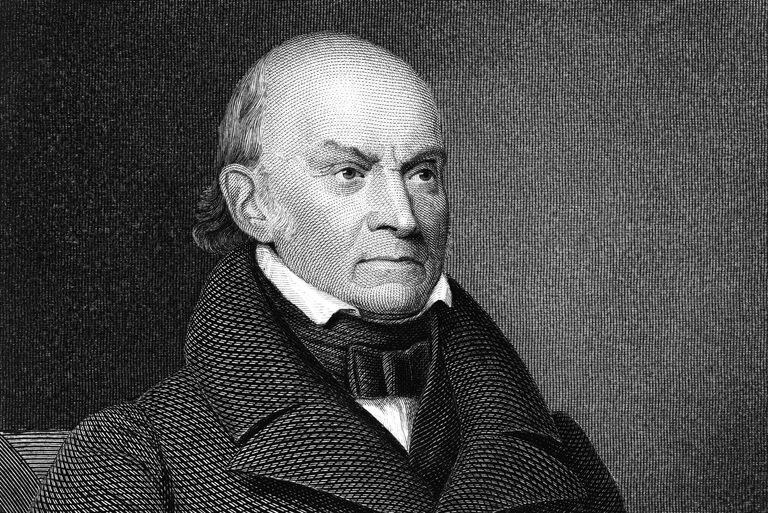 Though the presidency of John Quincy Adams was controversial, and was by most standards a failure, Adams did make a mark on American history. The Monroe Doctrine is perhaps his greatest legacy. He is best remembered, in modern times, for his opposition to slavery, and in particular his role in defending the slaves from the ship Amistad.